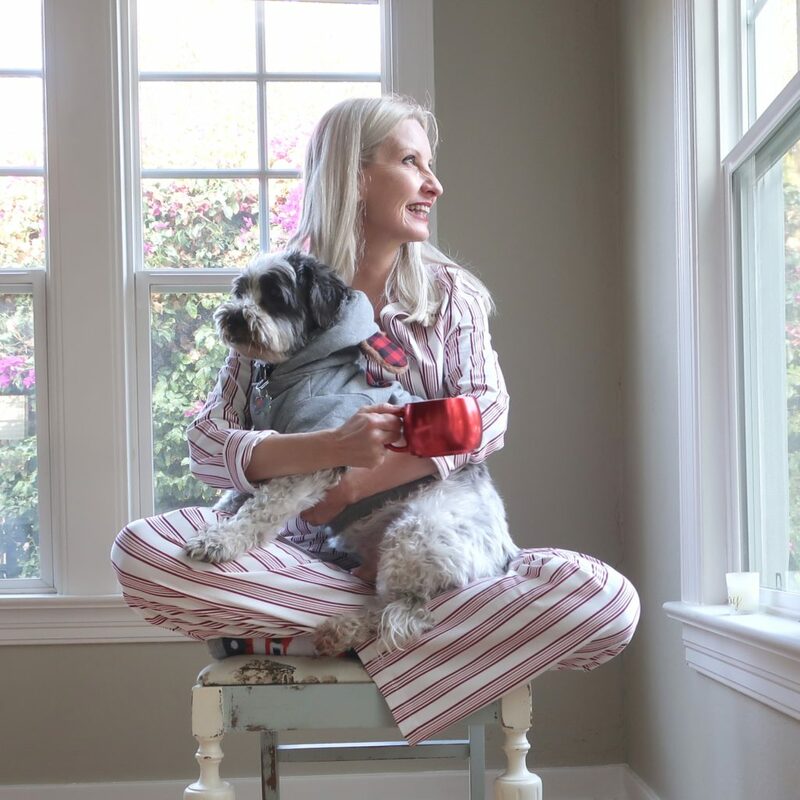 Soma Embraceable Pajamas – Candy Cane Stripes! There’s nothing better than relaxing in adorable, comfortable, super soft pajamas. Soma is always your one stop shop for all things cozy and comfortable, for yourself and to find the perfect gift! This post is sponsored by Soma Intimates, one of my favorite brands. I’m wearing the Embraceable Long Sleeve Notch Collar Pajama Top in Noble Stripe Ivory, with the matching Pajama Pant. These adorable pajamas are medium weight soft jersey knit made of cotton, modal, and spandex for just the right amount of stretch. Available in several fabulous prints, my favorite is this pretty red and pink stripe … I’ve nicknamed it the candy cane stripe! You also need to check out the whole collection of prints … snow globes, wine, florals, presents, stars, snowflakes … so many adorable prints for the season! These are the perfect PJs for starting the day and ending the day in comfort and style. I can’t wait to wear them cuddled up by the fire or under the Christmas tree! Here I’m relaxing with a coffee and my two favorite furry buddies. I’ve just started getting the holiday decorations out of the basement and little by little, it’s beginning to feel like Christmas in the house. Right now, Soma is helping you get your holiday shopping done early, with a buy one, get one 50% off sale! Now you can make every woman on your list feel cozy and pretty this year! Get your cozy on, AND get your gift shopping done, right now at Soma! Okay, so excuse me, but I’m wearing my Soma PJs right this minute, and I need to go cuddle and relax … and do some online sale shopping! Woohoo! Cute pajamas! I own nothing from Soma but I really need to get into the store and try some things!